I'll apologise now to any and all hard-bitten REM fans who may be reading this, but God, he's bloody irritating when he opens his mouth to sing, isn't he? I never was a massive fan of those sons of Georgia. I own the CD single of This One Goes Out To The One I Love (still a great cut, even after all this time) and the album Out Of Time (mainly for the couple of tracks you'd expect), but that's it. I quite like What's The Frequency, Kenneth, too, but have never been moved to buy it. It's his voice, you see. I'd like to like Michael Stipe's vocals...I'm sure that his devotees can hear in it something I can't. But no – after more than three songs in a row, I want to remove my eyes with a rusty spoon and jam an eyeball down each auditory canal, just to block out his nasal whining. He sounds as a house-cat would if it grew to the size of an adult human and had its tail trodden on in rhythm. The task in hand, i.e., my review of the album Saltykisses by German/Japanese duo Guitar, presents me with the same problem (only without Stipe's fingers-down-a-blackboard voice). This is not a bad album. Guitar's two members, Michael Luckner and Akayo Akashiba (I'll leave it to you, gentle reader, to decide which of this two comes from Germany and which hails from Japan), seem to be genuinely striving to produce something different in what is already an overcrowded segment of the market. Ulrich Schnauss-like synth pads abound, especially on the second track At The Seaside, along with processed-to-death guitars (think of the rather excellent Broken Social Scene's Backyards - without so much finely-honed, God-like, BBS chaos - and you'll be more or less there). It's all fairly innocuous stuff. Be Joy does what it says on the tin and lilts along in a happy conglomeration of guitars, synth bass, drum machines (very much in the mould of that Icelandic genius Stafrenn Hakon) with Akashiba's charmingly-accented vocal floated on the top, like a lily-pad on an ornamental pond. But at six minutes and fifty-one seconds, it's a minute and a half too long for a song which really doesn't go anywhere. And that, my loves, is the sticking point of the whole album. Luckner and Akashiba would have been better served had they increased the song count, whilst decreasing the song length. There's an old tailors' saying – "Never mind the quality, feel the width". 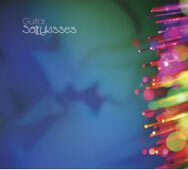 So it is with Saltykisses – too few good ideas stretched until the listeners' collective eye waters. There is the odd weird track here; While My Insect Gently Weeps sounds like a field recording in a swamp, with a couple of synth oscillators and guitar chords injected here and there. It's a nice idea, but too lacking in cohesion to hold the listener's attention for very long. The band really does go seriously astray with two consecutive tracks, namely If I Didn't Meet You and Wenn Die Strassen Schoene Namen Tragen. The former is a chugging, syncopated acoustic guitar over a droning bass note and a one-handed piano line, again with Akashiba's vocal whispering in the spaces. Unfortunately, the instrumental piece of the song is just a reworking of the much-covered Ben E King piece Stand By Me, which also, don't forget, begat Every Breath You Take by The Police. Again, at seven minutes thirty-four, it's an idea stretched way, way beyond its operational tolerances. And mine, which is why I had to reach for the skip button after three and a half minutes. I don't know if it's some kind of German/Japanese joke, but immediately after this, Wenn Die Strassen Schoene Namen Tragen (which Google assures me translates as "When The Streets Wearing Beautiful Names"...I can't vouch for the lack of an apostrophe in the word "streets", but there you go...what d'yer expect for free translation...Peter Ustinov?) kicks in with basically the same chord sequence under Luckner's German vocal. Singing Stand By Me along with this is possible, although Every Breath You Take or Del Amitri's Always The Last To Know both fit quite nicely. It's underwhelming, to say the least...and six and a half minutes long, during which that chord sequence really begins to grate on the nerves. There's also a self-indulgent track of cacophony (Strangewaves), a track of monophonic Windy-and-Carl-wannabe-ishness which doesn't quite work (the title track of sorts – Saltyme and Saltykisses), a cowboy campfire song (Jodelei...I kid ye not, gentle reader...yodelling et al), and a faint-hearted, but always doomed-to-failure stab at sounding like Stars Of The Lid with the closing track (I Dream The Sand). So...like Michael Stipe's voice, I really want to like Saltykisses, but cannot. Some good ideas reside here, but they're either over-extended to the point of snapping like cheap knicker-elastic or poorly executed (as their management should be for allowing the Stand By Me tracks onto the CD). This could/should have been an EP, so lacking is it in worthy cuts. I'll keep my ear and eye out for Guitar, though – they may sneak up and surprise me one day.